You’re invited to Our Haus FRIDAY, APRIL 5, 2019 for a hi-energy polka party like nothing you’ve ever experienced! 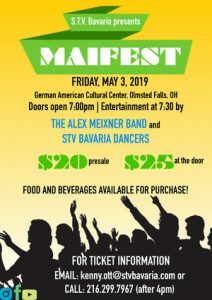 Grab your friends, family, and neighbors and celebrate that we’re finally halfway to Oktoberfest, with the hi-energy sounds of Grammy-nominated Alex Meixner and his flying accordion, along with his band of lederhosen-loving musicians! Don’t forget your lederhosen, dirndls, beer steins, and PARTY FACE! The hi-energy sounds of The Alex Meixner Band will take the stage at 6:30pm – Everybody POLKA! !